Is love (and possibly seasonal depression) getting you down? You’re not the only one! Join us for an evening of sketch comedy about everything love, relationships, dating, and all the stuff in between, and maybe feel a little less alone. 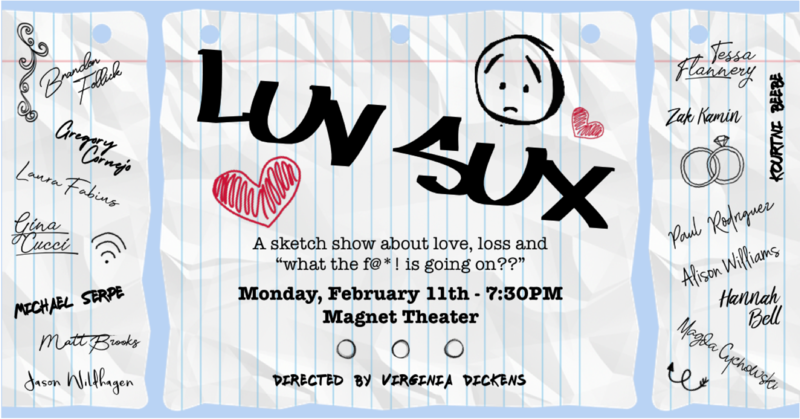 Luv Sux: A Sketch Show About Love, Loss and “What the F@! * is Going On?” was created and brought to life by Kourtni Beebe, Hannah Bell, Matt Brooks, Gregory Cornejo, Gina Cucci, Magda Cychowski, Laura Fabius, Tessa Flannery, Brandon Follick, Zak Kamin, Paul Rodriguez, Michael Serpe, Jason Wildhagen and Alison Williams.